This new 100-hp Posi-Track from ASV has suspended rubber tracks, single lever steering , no-stall drive, hydraulic coupler and lots of attachment power. The week after our first look at the RC-100 in Florida, we visited ASV in Minnesota, where the RC-100 (left) demonstrated its greater lift height against the 4810 (right). Note the difference in track configurations, and how the RC-100's track design allows dual rear fuel tanks. ASV's new Posi-Track RC-100 All Surface Loader features a new undercarriage design, a load-sensing implement hydraulic system, standard high-flow auxiliary hydraulics and a standard hydraulic quick coupler. As this cutaway illustration shows, the RC-100's undercarriage incorporates 21 wheeled contact points, internal sprockets (with replaceable rollers), plus rubber tracks that contain no steel. Wheel bearings use proprietary seals and are maintenance-free. Attachment compatibility is no problem for the RC-100. 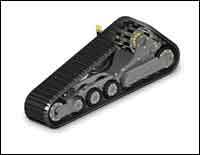 It uses a universal coupler (hydraulically actuated) that accepts most larger skid-steer tools. The auxiliary-hydraulic service block, inside the left lift arm, provides both low and high-flow hookups, plus a case-drain port and an electrical receptacle. The RC-100's tilt cab and tilt hood give easy access to power-train components and routine maintenance points. A pilot generation block ( a central manifold for hydraulic-function solenoids) further enhances serviceability. The air-conditioner condenser is now part of the machine's under-hood cooling system, which features a larger side-by-side radiator/oil-cooler package and a larger, slower-turning fan that makes the RC-100 a quiet runner. An old adage says we're known by the company we keep. In a way, that's true for ASV, a hard-working company in Grand Rapids, Minn., that builds rubber-track loaders. Several years ago, none other than Caterpillar, impressed with ASV's technology, purchased a small stake in the company and now buys ASV undercarriages for its Multi-Terrain Loaders. And Polaris, of snowmobile renown, brands ASV's RC-30 loader as a core product in its Professional Series. But, of course, ASV, all on its own, has earned credibility with end-users by supplying a steady progression of innovative products. The latest of which—and the subject of our discussion here—is the just-announced RC-100. Construction Equipment editors had the opportunity for a first look/first drive of the new RC-100 in mid-December, when ASV was doing final prototype testing at a remote sand quarry in Tallahassee, Fla. There we caught up with ASV's marketing manager Brad Lemke, design engineers Cary Safe and Clem Moger, and communications manager Kevin Yopp. We were fortunate to get a sunny break in the rain clouds during our visit, but the powerful heater in the RC-100's enclosed cab still felt plenty good. Whenever we climb into an ASV machine, we know we're in for a smooth, stable ride, because the company's hallmark design feature is a big, flat-footed, rubber-track undercarriage with torsion-axle suspension. Our introduction to the ASV undercarriage came several years ago, when, during a visit to the company, we were encouraged to run a new Posi-Track 2800 at full speed over 4×4 fence posts placed in its path. We braced for a shaking, but the machine's undercarriage, the Maximum Traction and Support System (MTSS), swallowed up these impediments with hardly a shudder. The new Posi-Track RC-100 All Surface Loader, with a 10,180-pound operating weight, is no exception in the smooth-ride department. Although its undercarriage design differs from that of the 2800 we first operated, the new model flexes comfortably over rough terrain, and its stability is further enhanced by a low center of gravity, attained principally by placing its engine low in the frame. From the short time we operated the RC-100 in Florida, we sensed that its 100-hp Caterpillar 3054 CT engine, which is Tier II compliant, its new closed-center hydraulic system, and its radial-piston drive motors combine to give this new machine plenty of power. It's strong on grades, has the torque to push aggressively into tough material, and has ample breakout force. Operating capacity is 3,800 pounds, when rated at 50 percent of tipping capacity, and 2,660 pounds when rated at 35 percent. In the cab, the pilot-operated, single-lever steering controller (based on Caterpillar technology) and the single-lever controller for the loader add greatly to the machine's operating ease. Changing attachments is easy, too, thanks to the RC-100's standard hydraulic quick coupler, which allows the operator to switch tools without leaving the seat—except to connect hydraulic lines to powered attachments. Yet another operator-friendly feature is the machine's anti-stall system, which automatically reduces pressure in its hydrostatic drive system to prevent engine stalling in tough loading situations. Once loaded and on the move, though, the RC-100 is fast, with its two-speed drive system providing a top speed of 10 mph. The operator can switch between high speed and the 5-mph low speed via a switch in the right joystick. Because the machine uses "internal" or cage-type sprockets, similar to a snowmobile, says Lemke, speed is not restricted by mechanical limitations, but, instead, by practical considerations. Officially, ASV considers the RC-100 a replacement for the Posi-Track 4810, a popular 105-hp machine that has been in the ASV line since 1999. For most 4810 applications, says Lemke, the RC-100 is the perfect replacement. But in a few instances, he says, the 4810 may be preferred for its special attributes, and will be available for a limited time. The 4810's design, for instance, allows you to pin the loader-arm assembly (with its mechanical quick coupler) up out of the way, then quickly install a frame-mounted, honest-to-goodness, six-way dozer blade for serious pushing. The design also allows you to completely remove the loader-arm assembly, install a three-point hitch, reverse the seat, then drive off in the opposite direction with implements in tow. So what does the 4810 user give up by moving to the RC-100? Not much, really. The RC-100 is not bi-directional, so you can't use it with a three-point hitch, and it doesn't accommodate a frame-mounted blade, although it does handle a hefty attachment blade. Also, its undercarriage, while providing a comfortable, stable ride, is not quite as supple as that of the 4810. If you take the long view of the 4810 and RC-100 designs, you might say that ASV, with the new model, has developed a machine more in step with today's market for small, versatile, low-ground-pressure machines. The RC-100, in fact, is the third model in ASV's new R-Series Posi-Track range, which was launched two years ago with the 31.5-hp RC-30, having an operating capacity of 800 pounds (when rated at 50 percent tipping capacity). The RC-50 followed, having 50 horsepower and 1,500 pounds of operating capacity (at 50 percent), and was designed specifically to compete directly in size and price with mid-range skid-steers. If you want to look a bit deeper into the design philosophy behind the 4810 and the RC-100, the undercarriage is a good starting point. Both incorporate the basic features of an ASV undercarriage. This includes a system of rubber-rimmed wheels that spread the tractor's weight evenly over wide rubber tracks (which contain no steel), torsion-axle suspension and, as noted, internal sprockets with replaceable rollers that engage chunky rubber lugs inside the tracks. (The lugs are 37 percent larger on the RC-100 and have a patented new shape for better track guidance). The 4810's MTSS undercarriage, currently used on other ASV models and certain Caterpillar Multi-Terrain models, uses 24 wheels on each side of the tractor, eight rows of three. The RC-100, with an enhanced version of the company's new R-Series Traction and Support System (RTSS), uses 21 wheels, seven rows of three. All seven of the new model's three-wheel assemblies are mounted rigidly to the track frames, while the 4810's center six assemblies are mounted in pairs to three articulating carriages (bogies). The carriages, in turn, are mounted to the track frames with torsion axles, and the frames are then mounted to the tractor with additional torsion axles. The RC-100, by contrast, uses only two large torsion axles to suspend the undercarriage, with the axles transversely connecting the track frames. The RC-100's elevated drive sprockets, positioned farther forward than those of the 4810, give its tracks a triangular shape, compared to the parallelogram-like shape of the 4810's tracks. Sprocket placement on the new machine creates space for two large fuel tanks at the rear, and also makes more efficient use of track length. To wit, the RC-100, while having tracks that are 20 inches shorter than those of the 4810, has just 6 inches less track-on-ground. The new machine also has a wider stance, measuring 68 inches across the tracks, compared to the 4810's 66 inches. The RC-100's across-the-tracks measurement also is its true width, but because the 4810's track frames extend 1.5 inches beyond the edge of its tracks, it has a total width of 69 inches. "The new undercarriage for the RC-100," says Lemke, "is a practical blend of performance, reliability, simplicity and economy." The 4810's implement hydraulic system uses two gear pumps. One pump (19 gpm at 2,950 psi) handles standard flow needs (boom, bucket and small attachments), and the other (30 gpm at 3,200 psi), the high-flow needs of larger attachments. In this system, hydraulic oil is always being pumped (the volume varies with engine speed), and if there's no work for it to do, it flows through the open center of the control valve and back to the hydraulic tank. Such "open-center" systems have their advantages, but they can waste horsepower by pumping unneeded oil. By contrast, the RC-100 uses only one pump, but it's an axial-piston, variable-displacement type that senses pressure in the implement hydraulic system, then adjusts oil flow accordingly. The pump supplies up to 20 gpm at 3,300 psi for standard-flow needs, and up to 38 gpm at 3,300 psi for high-flow needs. Because the system pumps only the oil actually needed to do the work at hand, it frees substantial engine horsepower that can be used to power the tracks. 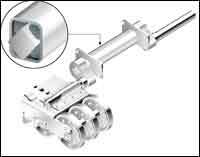 Steel lines on the inside of the left lift arm bring auxiliary hydraulics (both low- and high-flow) to a service block just inside the boom knee. There, flat-face connectors allow clean, fast hook up of powered attachments. And if an electrical connection also is needed to operate the attachment, the block has a ready receptacle. If a large powered attachment has a case-drain line (to siphon off leakage from its hydraulic motor), the line is easily plugged into a connector on the service block. ASV has fitted the case-drain line with a filter, which ensures that oil coming from the attachment is cleaned before it reaches the hydraulic tank. Good idea, since it protects the host machine from dirty oil that may be lurking in a rented attachment. Other hydraulic refinements that point up the careful design of this new machine include large, 2.5-inch pump-supply lines to minimize turbulence and heat, the positioning of all tank-return lines downward to reduce aeration and the liberal use of steel piping. Says ASV, steel piping, designed and bent via computer to ensure perfect fit, generally is more reliable and less expensive than hoses. In our opinion, the RC-100 All Surface Loader is a natural progression of the company's new R-Series range. These new machines, while reflecting the precision of computer-aided design and the efficiency of today's technically advanced engines and hydraulic components, nonetheless preserve the fundamentals of the original Posi-Track design, which has served ASV well since 1988. So, how much will the refinement designed into the all-new RC-100 cost you? Under $50,000, says Lemke, who hadn't yet established an exact list price when last we talked. By comparison, he says, the typical 4810 listed for around $55,000. The RC-100 was officially announced in early February and should be arriving soon at ASV dealers. Retail outlets for R-Series Posi-Track models may include a limited number of Caterpillar dealers, but most will be independent, non-Caterpillar dealerships.